Lemon and Rosemary Sea Salt Cookies — Newport Sea Salt Co.
A cookie without chocolate chips?! That just doesn't happen in my house, but last night I was in a mood to try something different. We all need to try different things, right? Go crazy every once in a while. Forgoing chocolate chips was my idea of crazy? Hmmm….I need to get out more! I was definitely questioning the savory idea of an herbal cookie, but I love rosemary and of course, sea salt. I thought I would give it a try and I am so happy I did! Thank you, Pinterest, Chrissy Carter (the recipe creator), and of course, butter, flour, sugar, and sea salt! So, here is another good way to use our sea salt and don’t forget a little goes a long way. I used a small crystal French sea salt called fleur de sel that we acquired along our European travels for the dough and I used our flaky Newport Sea Salt sprinkled on top. Cool, right?! - mixing Frech and American sea salt! Who said the French and Americans can't get along?! At least they can when it comes to good ingredients! After you slice your cookie dough log and place the slices on a parchment lined baking sheet, remember to tap the salt flavor crystals down a little bit so they don't fall off when you go to bite in the buttery savory cookie. You don't want to miss out on the flavor level! We had a picnic meal on our deck last night with Comte and Brie cheese, grilled sausage, an artichoke dip accompanied with a crusty baguette and grilled peppers with a sprinkle of sea salt. It was divine watching the sunset over the Newport Harbor. As the sun dipped behind Jamestown, we bit into our little Rosemary Sea Salt cookies and relaxed into the weekend. PS - I may just double the recipe next time! They are that delicious! Experiment with different herbs…life is about trying new things, isn’t it?! And if you do, let me know how it goes. There is a little place to make comments below. I would love to hear from you! 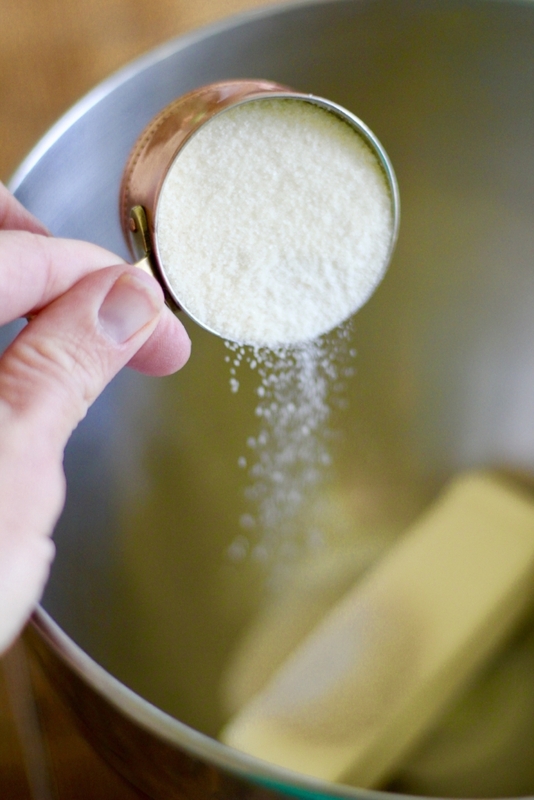 pinch of sea salt for the dough, plus extra for sprinkling - Newport Sea Salt Co. Combine the butter, sugar, rosemary, and pinch of salt. Slowly add the flour, mixing thoroughly with each addition. Take your time combining the flour so it forms into a nice buttery dough. Form the dough into a ball and wrap loosely with plastic wrap. Shape the ball into a log and roll it with your palms until it’s relatively even in circumference. Pop the dough into the freezer for 15-20 minutes so that it hardens enough to slice into 1/4 inch rounds. Place the rounds on a sheet pan and sprinkle each cookie with a healthy amount of course sea salt - of course from Newport Sea Salt Co.
Bake until light golden brown, approximately 15 minutes. Sugar meet butter...a perfect match. A pinch of salt and one for over your shoulder. Salt cellar from Styled by Jenna, Newport, RI. Roll it into a ball...hopefully better than mine. Silce and Sprinkle with sea salt. A little cookie packed with savory flavor. Time to bake some more!